Readers of this blog know that there's pretty much nothing I love more than the fried foods of the State Fair of Texas. From classic favorites like Fletcher's Corny Dogs to newer items like the Fried Oreo or the Fried PB&J, the Fair never disappoints with its mouth-watering additions and jaw-dropping creativity. Since 2005, the State Fair’s Big Tex Choice Awards contest has solidified the annual exposition as the “Fried Food Capital of Texas®.” Each Labor Day, media is invited to taste eight new fried concoctions. Some are sweet. Some are savory. All excellent in their own right. Last year's Fried Thanksgiving Dinner from Justin and Rudy Martinez won the award for "Most Creative" and it was was GENIUS. State Fair concessionaires fry up tasty and unique foods for a chance to become a finalist in the Big Tex Choice Awards. Winning the "Most Creative" or "Best Taste" award can mean up to $250,000 in sales over the course of the Fair so this award is a BIG deal! Everything from Fried Beer to Fried Peaches and Cream have made the cut to become a part of this exclusive club. Last year, I ranted that the State Fair of Texas needed to rethink their judging scenario and I started lobbying then that I would be a great person to help pick the winners for "Most Creative" and "Best Taste". They actually listened and I have been invited to be a judge in this 10th Anniversary celebration of the Big Tex Choice Awards along with my pal, Tiffany Derry, star of Hungry Investors and Top Chef alum. Hawkeye from KSCS radio will be our emcee and more judges will be announced soon. Whoo hoo!! The lineup of judges isn't the only thing changing. For the first time ever, fans will have the opportunity to attend this event on Monday, September 1, at 10 a.m. and be among the first people to taste the food finalists in this annual food competition. A limited number of tickets are available to State Fair of Texas fans. 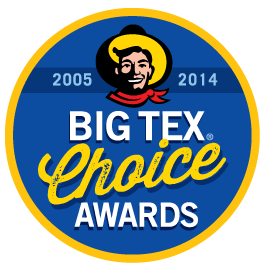 Admission to Big Tex Choice Awards – Monday, September 1, 10 a.m.
All proceeds from the Big Tex Choice Awards ceremony will be donated to the State Fair of Texas Youth Scholarship Fund. Eligible scholarship recipients include graduating Texas high school seniors who have participated in specific Youth Livestock competitive events held at the State Fair of Texas, and graduating seniors from five Fair Park area schools – James Madison, Lincoln, North Dallas, and Woodrow Wilson High Schools, as well as the Irma Lerma Rangel Young Women’s Leadership School. 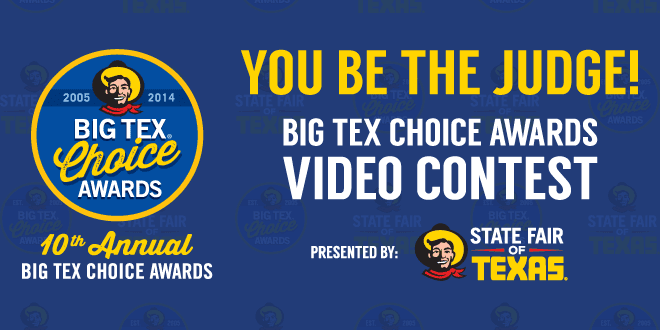 UPDATE: (August 7) You now have until 5 PM CDT on August 14, 2014 to submit your video at BigTex.com. Voting for the finalists will begin at 9 AM CDT on August 15 and end 5 PM CDT on August 18, 2014.